Cheezyn.pk is Pakistan’s biggest online store and the only store in Pakistan offering products for all age groups. Why should I choose cheezyn.pk? Cheezyn offers amazing goods at reasonable prices, the best deals and a Reward Point System; enabling you to benefit every time you buy something. There are two options of using Cheezyn.pk; you can register and then buy, or you can buy goods as a guest. However, the Reward Points System is only available for the Members of Cheezyn.pk. Do I have to register to use Cheezyn.pk? It is not necessary to register to use Cheezyn.pk. You can order goods as a guest. However, it is imperative to register in order to avail the Reward Points System. All you have to do is click on the ‘Log In’ option on the upper right corner, click ‘Create New Account’ and fill in your basic contact details. You will receive a confirmation email, click the link and you are registered! Yes, you can reset your password. The process is very simple: Just click on the ‘Forgot Your Password’ button, and type in your email address. Click submit and you will receive a link to reset your password. Yes, your email address can be changed. All you have to do is click on ‘My Account.’ You will get your Account details. On the right side of Contact Information, there is an option to ‘Edit’. Click it and change your email address. How do I buy on cheezyn.pk? Browse the products to see what you want. Once you have decided, click on ‘Add to Cart’ option of the product. You will see a popup for 10 seconds and asked to continue shopping or go to shopping cart. If you click on the ‘View Cart and Checkout’, you will be transferred to the checkout page, where your total amount would be given and you can check out. Your goods will be delivered at the postal address that you have given. How do I find an item on Cheezyn.pk? We have various categories for different products. You can click on the relevant heading or subheading of categories to browse listings. If you have a specific product in mind, you can use our search option. All you have to do is click on the search box, type the name of the product or a few words describing the product and click ‘Search’. Cheezyn.pk will provide you with a list of all the products matching your search description. When will I get my product after I place an order? It will take 2-3 working days to deliver your product. There are no charges. We are offering free deliveries all over Pakistan. You will receive your order in two working days. Shipping and deliveries are only done on weekdays so the receiving time period will vary if you ordered on the weekend. If you ordered before 5pm, shipping will be done on the same day; after 5pm will result in shipping being done the next day. 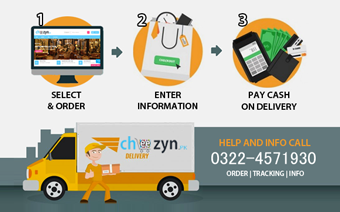 Cheezyn.pk has a “Cash on Delivery” policy, meaning that you will pay for your shopping, in cash, when it is delivered to you. What if the Product I want is ‘Out of Stock’? If the product you want is out of stock, that product will be marked as ‘Out of Stock.’ You will have to wait for a new shipment of the product. How do I complete or check out an order? Once you are done with your shopping, click ‘Check Out’. You will be asked to fill in the required contact information, discount code (if you have one) and will be able to see your bill. Clicking ‘order’ will result in a confirmation email being sent to you. Do I have to pay any taxes on the products I order? Currently, you are not required to pay any tax on the ordered products. No. The orders can only be delivered in Pakistan. When will you have Special Offers or Deals on Products? We will have Special Offers or Deals for every occasion and season. How will I know about these Special Offers or Deals on Products? Our Special Offers or Deals on Products will be advertised on our Facebook . Reward Points are bonus points that a member gets every time they purchase item from Cheezyn.pk. These points can be used to buy goods for free. Every time a member buys items from cheezyn.pk, they will get reward points. Every product will have a certain amount of reward points. Instead of cash, you can pay for certain goods with your Reward Points.